US, 2008, 89 minutes, Colour. Ari Gold, Michael Mc Kean, Jane Lynch, Adrian Grenier, Shoshannah Stern. Adventures of Power is an amusingly oddball comedy. It takes up the theme of so many films of music, dancing and competitions, with the least likely competitor winning. However, this film is about air-drumming. There was a documentary, Air Guitar Nation, in 2006 which took some real-life air-drummers, followed their careers, their training, the competitions, as far apart as Finland and the United States. There was a craze during this time for air-drumming. Obviously, Ari Gold who appears as the drummer, wrote and directed the film, really likes this phenomenon – and makes a fairly good visual case for the skills required in empathising with the music, the rhythms as well as imagining the instruments that might be played. The film is given a US social background, copper mines in New Mexico, capitalists taking advantage of the miners, the possibility of strikes. Ari Gold portrays Power, the very awkward son of the union leader (played by Michael Mc Kean, rather more seriously than in his usual roles). Jane Lynch has an agreeable appearance as Power’s aunt. 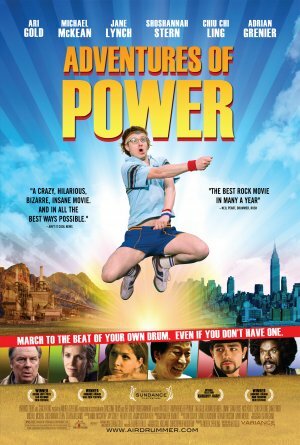 Because of his ineptness, Power goes, with the help of a genial little boy who befriends him and is the only one to stand up for him in the town, goes to Mexico for a competition and is headhunted by a school in New Jersey. He goes to New Jersey, indulges in his air-drumming – but also encounters a woman, who thinks that rock ‘n roll is the work of the Devil, despite her being a rock ‘n roll singer earlier in her life. She has a deaf daughter, Shoshannah Stern (who is actually deaf and comes from a four-generational family of deaf people). The band takes on Power, there is a rivalry with a young man who is the pampered son of the mine owner. Ultimately, there is confrontation at the concert, some shenanigans and high jinks – and a victory. Needless to say, Power sends his winnings back to the family, who have been watching the TV program with all the miners, giving them financial support for the confrontation with the capitalist. In many ways the film is dopey, however, it is enjoyable dopiness. 1. Audience interest in the characters, the situations, air-drumming? 2. The work of Ari Gold, performance, the air-drumming itself, writing and directing? His film? 3. The background of New Mexico, the copper mine, industry, Power and his awkwardness with the workers, the accidents? Living with his aunt, her kindness? Giving the rooms to passing people, renting his room, his staying in the tent? The clashes with his father, his father coming to see him? The attempt at reconciliation? His father at work, dismayed about Power’s accidents? His speech at the club, glimpsing his son and the air-drumming and people’s reactions? 4. The situation in the town, the copper mine, the union, everybody working, conditions, the walkout? 5. The contrast with Houston, his wealth, his disregard of the miners, his spy, sending in thugs to bash the picketers? His relationship with his son, disapproval of his air-drumming? Giving him drums? Threatening to cut him off? 6. Power and the little boy in the town, friendship, his getting Power to come with him for the double date? Power’s performance, people spurning him? His walking with the boy, the advertisement, going to Mexico, performance, recommendation with the card to go to New Jersey? His travelling to New Jersey, hard work along the way, getting money? Arriving, the club? The Korean people and his defence of them against the thugs, their taking him in, his hard work? The woman upstairs, the evangelical church, her protests, rock ‘n roll as the work of the Devil? Annie and her attraction towards Power, her deafness, explanations? Their sharing the music, her sense of rhythm, understanding music through the air-drumming, the movement and the dancing? Her mother’s criticism, her going out to see Power? The possibility of a future together, his writing to his family, mentioning his girlfriend, their happy reaction? 7. The picketers and their being bashed, Power’s dad going to hospital? The miners all gathering? The build-up to the competition, the television? 8. The preparations for the competition? The various members of the band, their skills, the Sikh and his sense of rhythm, the leader and his hooks? The other members? Working together? The news of Power’s father in hospital, his wanting to contact him, the phone call, getting back in a hurry to the hall? 9. Dallas Houston, spoilt, playing the drums, preening himself, his clothes, his manner with the interviewer, with the MTV video clip? The interview, his being asked about his father, cutting off the questions? His handler? His determination to win the competition, going despite his father, the phone call, his father’s sternness? His performances? His arrogance towards the others? 10. The other competitors, the girl group and their performance? 11. The finalists, the energy required, sitting on the stools, the girl collapsing? The handler and his breaking Power’s stool? The two young men standing, Dallas’s collapse? Power and his win, giving half the money that he won to the miners? 12. Annie, her mother letting her go, throwing the cereal? The happy ending? 13. A feelgood piece of Americana, with eccentricities?